A BJP MLA Thursday criticised former bureaucrats who have sought Uttar Pradesh Chief Minister Yogi Adityanath’s resignation over the Bulandshahr mob violence, saying they were concerned only with the death there of two men and not of “21 cows”. MLA Sanjay Sharma, who represents Anupshahr assembly constituency in Bulandshahr, also said only the people have the power to remove a chief minister elected with a huge mandate. Over 80 former bureaucrats had written an open letter Wednesday alleging failure of the state and central governments in the handling of the December 3 mob violence in Bulandshahr’s Siyana Tehsil after cow carcasses were found near a village. 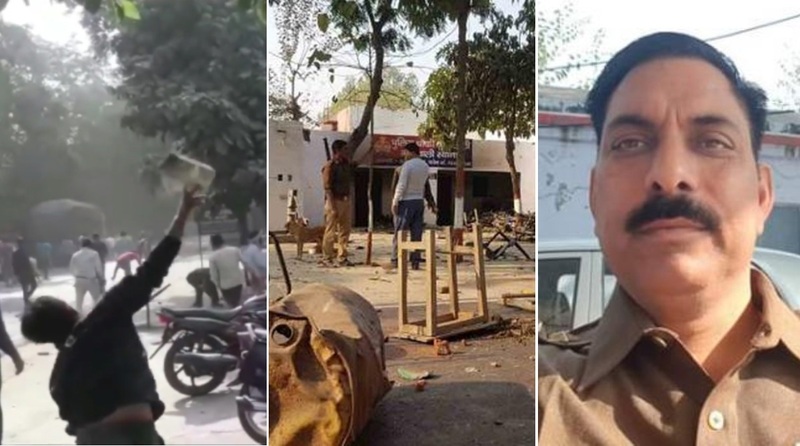 They had accused Adityanath of bigotry and sought his resignation over the violence in which an on-duty police inspector, Subodh Kumar Singh, and a civilian, Sumit Kumar, died after suffering bullet injuries. “Now you all are worried about the Bulandshahr incident. Your imaginative brains can see only the two deaths, that of Sumit and the duty-bound police inspector. You cannot see that 21 cows also died,” MLA Sharma wrote in his open letter Thursday. “In a state where farmers are tolerating the loss of their crops for the last two years for the sake of cows and thank the chief minister for stopping cow slaughter how would that Hindu then tolerate cow slaughter? “Had there been no cow slaughter, such an incident would not have taken place. Hence, the action against those slaughtering cows is correct,” he wrote. His letter comes at a time when the police in Bulandshahr have arrested three men over the alleged cow slaughter that took place in Siyana on December 3. Police registered an FIR for cow slaughter on a complaint by local Bajrang Dal leader Yogesh Raj, who had accused seven people. During the initial probe, police had arrested four people but later released them. Three men who were not named in the FIR were arrested Tuesday as “the actual culprits” in the case. Earlier RLD leader Ajit Singh had raised questions over the delegation sent by the BJP to Syana 16 days after the violence. He charged the BJP on Thursday for trying to protect the accused belonging to Hindu organisations and the BJP itself. Condemning the statement of CM Yogi that Bulandshahr violence was a conspiracy, the RLD chief said it is now an open secret that who was behind the conspiracy there. So far, 19 people have been arrested in the mob violence case, even as Yogesh Raj of the Bajrang Dal, who is a key suspect in the violence, remained at large. MLA Sharma said the former civil servants have accused the chief minister of bias against a particular community when he himself allowed them permission to hold a huge three-day congregation. “This happened in the same state where previous governments would not allow Ramleelas to be held in villages. Had there been a bias, why would the government allow the congregation?” he wrote. “On your demand for the chief minister’s resignation in your letter, in which you have umpteen times referred to the Constitution, let me remind you that only the people, who have elected the chief minister with a huge mandate, can remove him and not some scurrilous people like you who challenge the constitutional system,” Sharma wrote. The lawmaker also said the former bureaucrats’ letter appeared “politically motivated”. Five persons were arrested earlier on Tuesday for their alleged roles in the mob violence and the cow slaughtering cases in Bulandshahr earlier this month that had claimed two lives including that of an on-duty inspector and a civilian, officials said. Three of them have been arrested by the Bulandshahr police for their involvement in the cow slaughtering case, while two accused were nabbed by the Uttar Pradesh Special Task Force (STF) for the subsequent violence on December 3. Police inspector Subodh Kumar Singh and civilian Sumit Kumar, 20, were killed of bullet shots during the mob violence.